THE FACTOR (USA) (Roan or Grey 2008-Stud U.S.A. 2013, Aust. 2014). 6 wins-1 at 2-from 6f to 8½f, Santa Anita Malibu S., Gr.1. Out of a three-quarter-sister to SW Showering. Sire of 114 rnrs, 57 wnrs, inc. SW Noted and Quoted (Santa Anita Chandelier S., Gr.1), Multiplier, Cistron, Delphinia, Fact Finding, Kroy, Youngest Daughter, SP Action Everyday, Factored In, Five Star Factor, Senora Acero and of He's the Reason, Wicked Factor, etc. His oldest Aust.-bred progeny are 2YOs. Rainbow Easy (g. by Freeze). 2 wins at 1200m in Malaysia. Umajet (f. by Jet Spur). Placed at 3, 3d BRC Graham Ireland P.
Umanugget (Mossman). 5 wins-1 at 2-from 1200m to 1650m, A$135,750, BTC Mitty's 2YO H., MRC Blue Diamond 1st Acceptances H., 2d MVRC Mitchell McKenzie S., L, 3d BTC Inflight Publishing 2YO H., MRC CFV Community Connect P.
Quick and Easy - Win Fortune (Mac.). 4 wins at 1300m, 1400m, A$88,600, in 2016-17 in Aust. Umasaga. 4 wins to 1400m in Aust. Fuma. 2 wins at 1600m in Aust. Hialeah Star. 8 wins-3 at 2-to 1350m, A$156,700, BTC Making Loans Easy H., Couzinz H., 800 Wholesale 2YO H., Cesars Nightclub H., Brisbane Riverview Hotel H., 2d BTC Mater Hospitals Trust 2YO H., JWP Projects H., 3d BTC Aon H., QTC Seppelt Wines H., BTC Distinguished Partners H., Moreton Bay Sports Club H., QTC Bright Young Things H. Producer. Umagold. 2 wins. See above. MALEVOLA (Tale of the Cat). Champion Imported 2YO Filly in Panama in 2008. 6 wins-1 at 2-from 1000m to 1800m in Panama, Panama Clasico Dia de la Madre, L, Clasico Jose A. y Bernabe Perez, L, 2d Panama Clasico Antonio Tony Stanziola, L. Producer. CHOCANTE (Shocking). 5 wins from 1400m to 2200m, NZ$103,410, A$208,350, to 2016-17, Brisbane Cup, Gr.2, Counties Cup, Gr.3, Waikato RC Diamond Lodge Draft H., 2d WRC Kemeys Brothers H., 3d BRC Chairman's H., Gr.3, Te Aroha JC Team Wealleans H., WRC Mitsubishi Electric H.
DANEBAR (Danehill Dancer). 8 wins from 1400m to 2600m, A$336,550, SAJC Carlton Draught S., Gr.3, STC Lord Mayors Cup, 2d AJC Australia Day Cup, L, 3d SAJC Carlton Draught S., Gr.3, STC Winter Cup, L.
Golden Step (Sovereign Red). 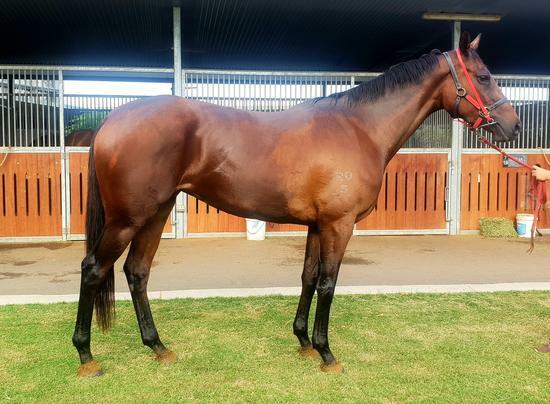 6 wins from 1300m to 1600m, A$261,200, AJC Smirnoff Vodka H., 2d Murrumbidgee TC Wagga Gold Cup, L, NSW Tatt's RC Tattersall's Club Cup, L-twice, STC Frank Underwood Cup, L.
HADABECLORKA (Hurricane Sky). 9 wins to 1400m, A$893,105, WATC Winterbottom S., Gr.2, Cyril Flower S., L, Miss Andretti Sprint H., Argonaut H., 2d WATC Colonel Reeves S., Gr.3, AJ Scahill S., Gr.3, Bunbury S., L, 3d WATC Hyperion S., Gr.3, Beaufine S., L.
CITY OF SONG (Bel Esprit). 5 wins-2 at 2-to 1400m, A$339,993, MRC Blue Sapphire S., L, Race-Tech 2YO H., MVRC Silver Thomas Hanley H.